A charcoal fire is perfect for grilling fish because the flesh quickly picks up a subtle, smoky flavor, but it tastes great on a gas grill too. And if you hate risking disaster trying to flip it, then this "no flip" grilled salmon recipe is for you. 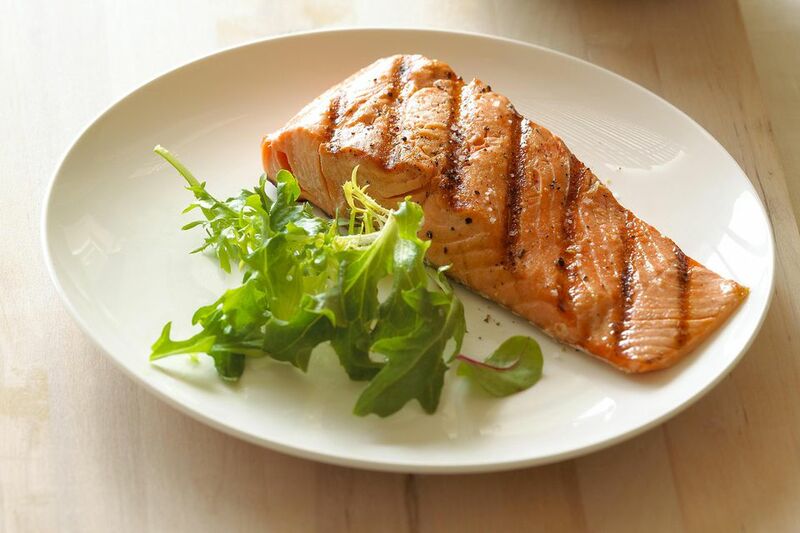 The salmon cooks on the skin side only, and the heat slowly transfers up through the fillet resulting in a moist texture. Prepare a medium-hot fire in a charcoal or preheat a gas grill to medium-high. Brush the flesh side of the salmon with the oil. Coat the salmon with salt and fresh ground black pepper to taste. Scatter the herbs over the top, and place skin-side-down on the grill. Close the lid and cook without turning for 10-15 minutes (depending on thickness), or until the salmon is just barely cooked through. The skin will blacken but will insulate the fish and prevent drying out unless overcooked. The surface of the salmon may appear slightly translucent but should be somewhat firm and very warm to the touch. Remove and cover with foil; allow to rest for 5 minutes before serving with lemon. Herbs can be discarded, or used as a garnish.